Obituary – Nash, Shirley Frances (Kennedy) « Perry High School Alumni Association, Inc.
Red Hots 45-47, Library Staff 45-47, Y-Teens 47-48, D. E. Club 47-48. ﻿Funeral was Saturday at Roberts chapel, Blackwell, for Mrs. Harry Nash, 42, of Utah, the former Shirley Kennedy of Perry. Burial was in Braman cemetery. Mrs. Nash died July 4 of an apparent heart attack at her home in Utah. 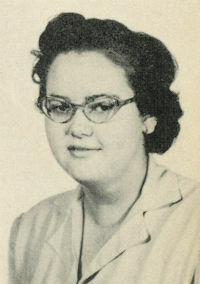 She was the daughter of Mr. and Mrs. John H. Kennedy of Elk City, formerly of Perry. Mrs. Nash was born Nov. 2, 1930, and graduated in 1948 from Perry high school. She and Harry Albert Nash were married February 13, 1953. Her husband is employed by Shell Oil company and the family had been transferred from New Orleans, La., to Utah in January. Among survivors are her husband, two children John and Tom, and her parents.